"I can’t remember when I started drawing dinosaurs, at some point in the first few years of my life. I remember that Deinonychus was my favourite dinosaur before the release of Jurassic Park in 1993. I was 7 when that movie came out and I remember feeling like the world had delivered a gift specifically for me. 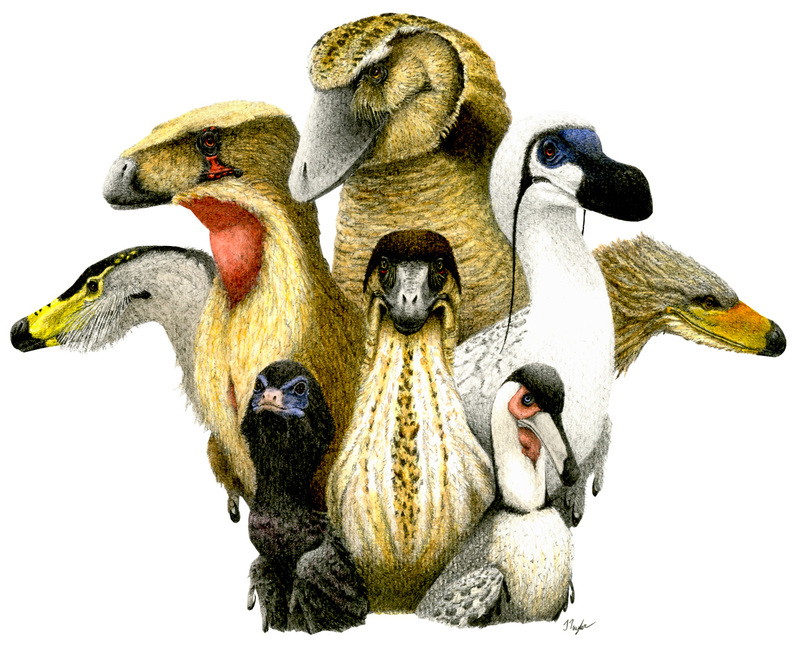 I continued to draw and learn about animals both extant and extinct until I was a teenager. The internet wasn’t the (sometimes) useful research tool it is now, so most of my knowledge came from somewhat outdated books and I spent a lot of time copying illustrations by people like John Sibbick and Ely Kish. 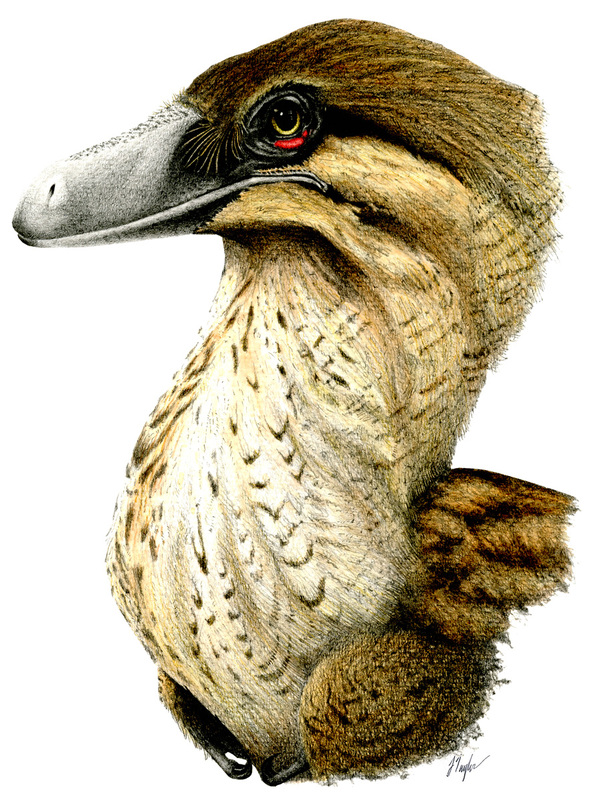 I also remember being very sceptical of the idea of feathered dromaeosaurs as a child, largely based on the fact that most of the illustrations that depicted this were...weird, especially in comparison to the sleek, muscular animals portrayed by Sibbick. I picked up the drawing again about 10 years ago, but only as a way to kill time at the extremely boring job I was doing at the time. I would draw characters, my pets, other animals. During this time I was also studying for my degree in Animal Biology with the intention of becoming a zookeeper (probably a story for another day). I maintained an interest in dinosaurs, but I was primarily interested in living animals and their behaviour. It wasn’t until 2013 and Colin Trevorrow’s infamous 'No Feathers' tweet in regards to Jurassic World that I thought about drawing dinosaurs again. Someone at work expressed the widely held and utterly bizarre sentiment that “feathered dinosaurs wouldn’t be scary”, and I attempted to prove him wrong with an illustration of a feathered Velociraptor. He agreed that actually it did look 'cool', and, feeling pretty pleased with myself, I thought I would compare my picture with what the internet had to offer. It didn’t take me long to realise that there was perhaps more to this than I had anticipated. I had made a bunch of the regular novice mistakes regarding feathering and proportions, and I realised I would need to do a lot more research. I am eternally indebted to the likes of Darren Naish, Mark Witton, Matt Martyniuk, Scott Hartman, Andrea Cau and the team at Love in the Time of Chasmosaurs (I’m sure there are others I’m forgetting) for an enormous online resource of easily accessible information on the finer points of prehistoric animal reconstruction. Research on blogs led me to primary resources and I started to put together my ideas. Once I had a bunch of animals drawn up, I took my portfolio to TetZooCon 2015. I had very much focused on side-on, left-facing reconstructions, and whilst I felt that the people I spoke to were encouraging and interested, I was left with the impression that I needed to go further. I was particularly inspired by Natee’s work. The poses, movement and detail blew my mind, and suddenly I felt like side-on, left-facing theropods just weren’t going to cut it. This set me up for two more years of research and secret drawing. During this time I left the 'extremely boring job' and set myself up as an artist, working mostly on commission. Pets, portraits, the odd wild animal. In my spare time I mostly drew birds. It really wasn’t until this year that I felt that my dinosaurs were finally ready to be shown to the world. I’m not going to give an exhaustive list of classic dinosaur artists of the '70s, '80s and '90s, you already know them, but I will mention two pieces which are relevant to my recent dromaeosaur pictures. John Sibbick’s Deinonychus pack attacking a Tenontosaurus and Robert Bakker’s running Deinonychus drawing were probably my favourites as a child, because I really bought the idea of them as living animals. 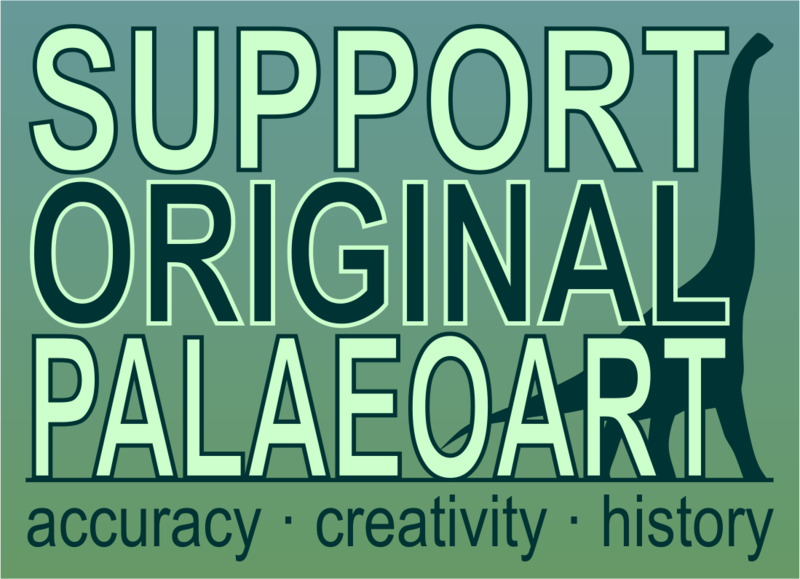 More recently there are artists like John Conway, Mark Witton, Emily Willoughby, but again I feel like any palaeoart fan will be more than familiar with the incredible artwork of these and many others, so they can’t all get a name-check. I’m a fan of the current diversity of style and interpretation that can be seen online at the moment. I post regularly on Instagram (where the young people live) and it really demonstrates to me how well the messages are getting through, and just how good the next wave of palaeoartists will be. In terms of stylistic influence it’s hard to say. A lot of my favourite artists use a style which is very different from mine. I love the art of C M Kosemen, but I think I like it partly because it seems so different to my own. I’m a big fan of Matt Martyniuk’s Field Guide to Mesozoic Birds and it is a constant inspiration to me, but again I don’t think the artistic style is similar to my own. Basically I’m not sure where my style came from, unhelpful as that may be. I like a lot of old paintings of birds and game animals, but I’m not well educated enough in art to be able to tell you any artists. I like the effect that a painting can have where for a second the interplay of light and shade makes you almost see it as a three dimensional object, but when you look a little closer you can see brush strokes, pencil marks or other elements of technique. I’m already feeling like I’ve named too many artists, not just because your readers will undoubtedly be familiar with their work already but also because there are SO MANY MORE. I feel like I’m leaving a lot of people out, and I’m basically a fan of everyone at every level and I am influenced daily by the work of others, especially on social media. It genuinely feels like a blossoming scene at the moment and I plan on singing the praises of a lot of other artists when I eventually get my own blog started. I start any reconstruction by looking at the fossils and skeletal diagrams, reading as much as I can and then attempting some rough structural sketches. Once I feel like I understand the basic shape of the animal I look at any research into integument/environment/lifestyle, and how other artists have portrayed the animal. Then I think about it A LOT. In some ways I like to try and present an alternative to what I have seen others do, but an alternative that is equally well supported by the fossil evidence. I’m not attempting to 'future proof' these images...if palaeontologists make discoveries that show I have speculated incorrectly, I’ll just do another picture or update the old one. What is most important to me is that it looks like an animal that could exist based on the information that we have, and based on my understanding of how living animals and ecosystems operate. I suppose the point I am trying to get across is I think we can always afford to speculate, as long as those speculations are rooted in some kind of reasonable hypothesis. No artist is going to get the life appearance of an animal that lived 100 million years ago exactly correct, and my general feeling is (based on the variety that exists in extant animals) that we often underestimate variety in favour of a 'conservative' view, which often then becomes a dominant trope. I found All Yesterdays very influential on my thinking in this regard. After all, an entirely non-speculative dinosaur drawing would be of a fossil. With respects to the dromaeosaurid images that I have recently done, I have MANY thoughts on the possible lifestyles of these animals, definitely too much to cover here. However I would say that I view them as likely predators of animals smaller than themselves, I don’t think the idea of a pack of them leaping onto a large (living) animal makes much sense. 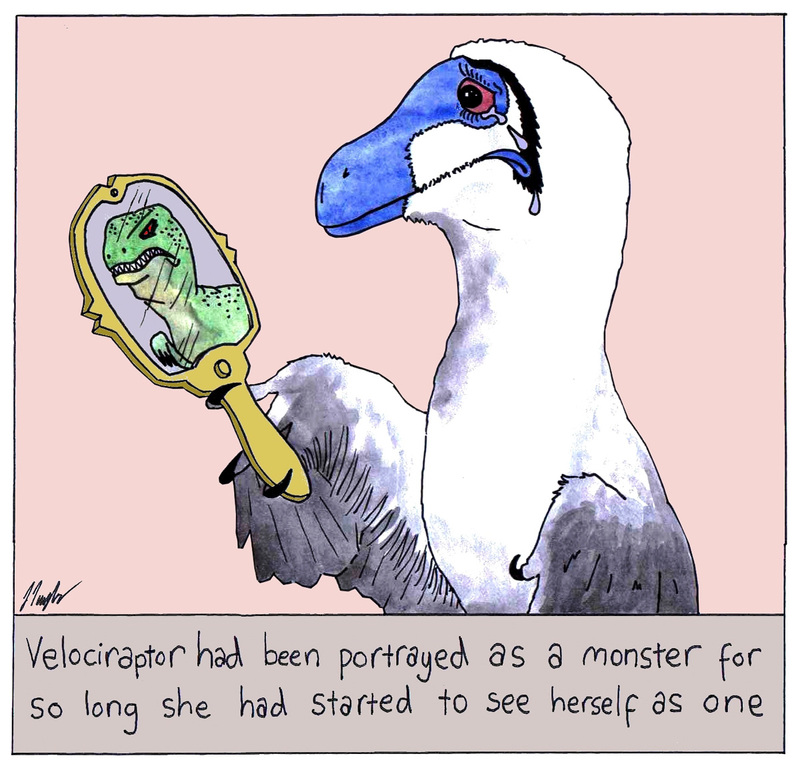 Apologies to fans of the flying-screaming-death-lizard-bird. I like thinking about things like visual displays, sexual dimorphism and other morphological traits linked to lifestyle and behaviour, which of course is highly speculative but we have a lot of examples to go on in living animals. I can’t stress enough how much I think looking at, learning about and spending time around living animals helps when thinking about the lives and ultimately life appearances of dinosaurs. Also most things are brown. Almost all the things that exist are brown. That may be a slight overstatement, but I prefer to restrict bright colours to display structures, as seems common in living animals. I could say a lot more about our dromaeosaur friends, I reckon it’ll be the topic of my first blog post (when I get round to it). I also regularly post work in progress pics and details of my full process on Instagram, Facebook and Twitter. He does funny stuff too, you know. In terms of materials, I use pencils and watercolour paints, usually on a watercolour paper and I do a bunch of rough sketches in preparation. I use references from my own photos for things like lighting and skin/feather texture, but I try not to use colour schemes entirely from a living species (although I occasionally break that rule for...reasons). 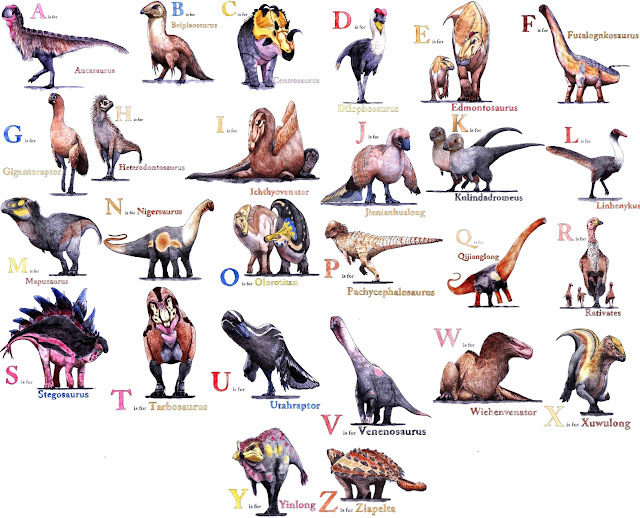 Some of my pictures, such as the dinosaur alphabet series, are in a slightly more sketchy, almost comic book style. I use generally brighter, more eye-catching colours for those designs, but they are still based on a thought process involving lifestyle, habitat, potential social behaviours etc. Basically if I’ve drawn something I feel like I can explain it. 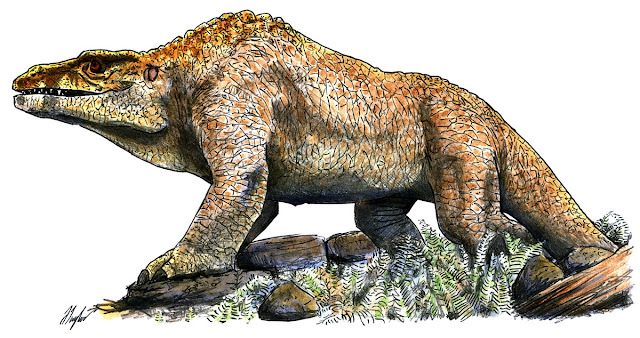 I have many, many more specific thoughts on restoring prehistoric animals but as I say I am planning on starting a (hopefully weekly) blog to discuss these thoughts and try and get some discussions going. More generally I would also like to add that one of my favourite things about palaeoart is the historical perspective on science it provides, and mostly for that reason my favourite EVER dinosaur reconstruction is the Crystal Palace Megalosaurus." 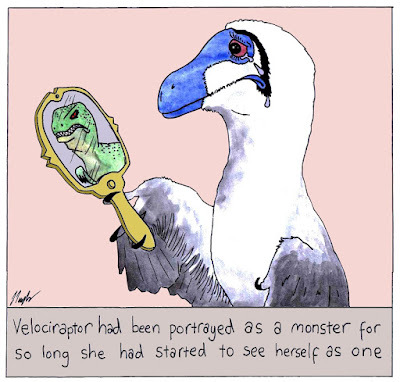 Well, that's very nearly what dromaeosaurs were. "And that's when he learned what dinosaurs actually looked like and that sci fi movies are just pretend." Awesome artwork, really make those therapies look like living animals.